Yasmeen Bano holds her newborn son, who was resuscitated by a Jhpiego-trained nurse. Yasmeen Bano’s baby was coming early—and in a rush of blood. She was 7 months pregnant, and she began bleeding while visiting her parents’ home. As her parents frantically arranged for transport to the nearest health care facility, the 28-year-old thought she might not live to see her baby. By the time Bano arrived at the Priya Maternity and Nursing Home, she had lost a lot of blood and her blood pressure was dangerously low. It was hard to find her pulse. The doctor in-charge, Dr. Geeta Pandey, said Bano would need an emergency cesarean. As she prepared for surgery, the doctor cautioned the family that because Bano had suffered a severe loss of blood, complications might still arise. 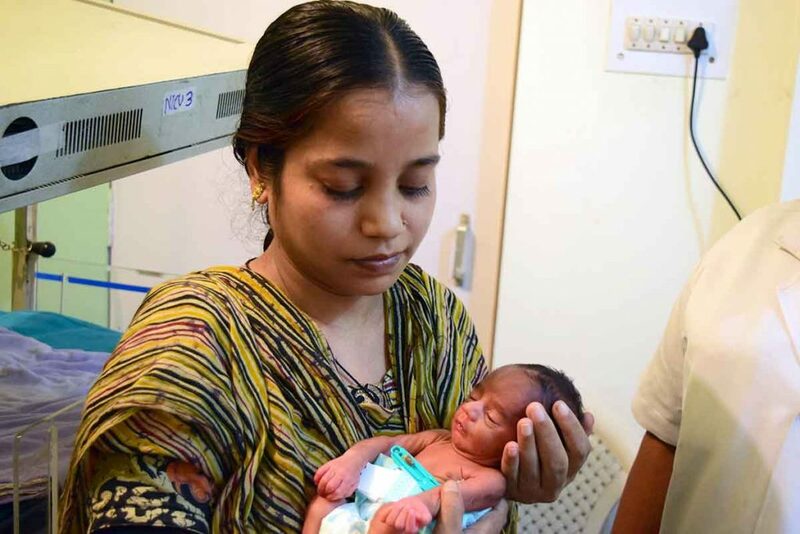 Bano survived the cesarean, but her tiny baby boy, weighing only 3 pounds, wasn’t breathing. A pediatrician had not yet arrived in the delivery room, but Rajesh Kumar, the nurse who assisted Dr. Pandey in the surgery, was prepared. Kumar had the necessary resuscitation equipment nearby—a bag and mask, a radiant warmer that was turned on, fresh warm towels and a shoulder roll. He had learned about the “golden minute” in his recent training with Jhpiego—he knew he had about 60 seconds to get the baby breathing before the newborn would suffer irreparable harm. 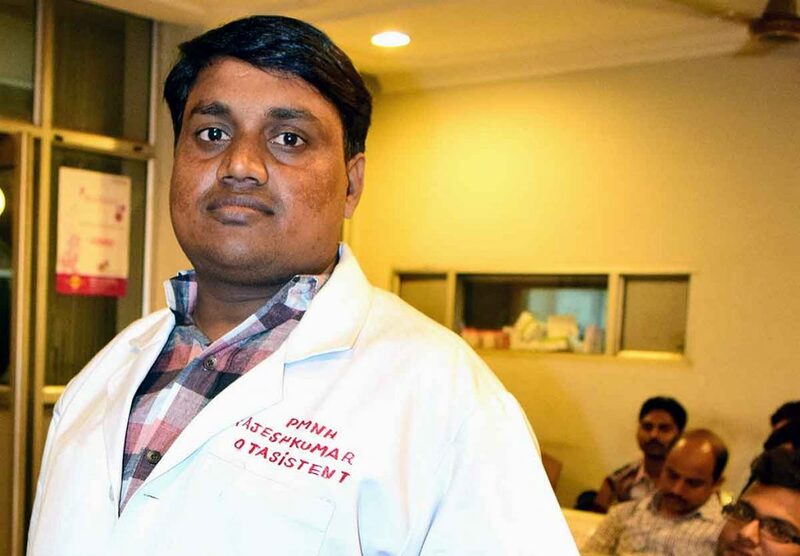 Nurse Rajesh Kumar used skills he had updated through a program supported by Jhpiego and MSD for Mothers to save the life of Bano’s newborn son. When the surgeon handed him the baby, Kumar dried and wrapped the newborn boy, cut the cord and placed him in the warmer. He properly positioned the baby’s neck, slightly extending it using a shoulder roll. Next Kumar suctioned the baby’s mouth and nose and tried to stimulate the baby. The baby did not breathe. Kumar conducted bag and mask ventilation, continuing until, slowly, the baby responded and started to breathe. Kumar ensured the baby was warm and watched to make sure he was breathing well. Because of the baby’s small size, Kumar placed him in an incubator in the nursing home’s neonatal intensive care unit. Both mother and baby were saved. Soon Bano would be able to begin skin-to-skin care, a wonderful way to maintain warmth for small babies. Kumar attributed his lifesaving care to the quality improvement program, supported by Jhpiego, that provided a 2-day training at his facility, where he updated his knowledge of and skills in care for mothers and babies immediately after birth. The training included prevention and control of infection, prevention and management of postpartum hemorrhage and newborn resuscitation. In India, despite a wide network of government-run health care facilities, private facilities, like the Priya Maternity and Nursing Home, provide care for a large proportion of births in health facilities. Therefore, the quality and level of care provided by these institutions are of great relevance to the country. Jhpiego is working with 140 of these private-sector health care institutions in two high-focus states, Uttar Pradesh and Jharkhand. In collaboration with the state and national governments and the Federation of Obstetric and Gynaecological Societies of India, and with support from MSD for Mothers, Jhpiego is implementing a 3-year program to improve adherence to high-impact, evidence-based health services for mothers at these facilities. Yasmeen Bano’s baby is evidence of how high-quality training and timely interventions can save lives. This program is empowering the nursing cadre with lifesaving skills to assist mothers and newborns. Dr. Renu Pandey is a senior program officer; Dr. Parvez Memon is a state program officer; and Indrani Kashyap is a senior communications officer in Jhpiego’s India office.